The new Minari Paramotor is strong, light and easy to transport due to the simple and brilliant cage design. New options include the Minari engine with a Clutch and Electric Start! This Minari Paramotor is ideal for use both with the TrikeBuggy and foot launched Powered Paragliding. 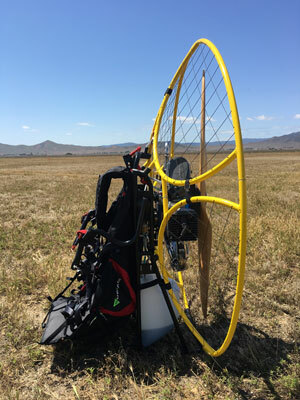 Foot launching pilots will find the Minari Paramotor very familiar and well balanced with the weight-shift Side Arms and comfortable harness of this machine. When you're ready to trike, the harness can be easily removed for use with the TrikeBuggy. The Minari engine is easy to start, idles nicely and has a very smooth range of power. It has easy access to the midrange thrust which is great for cruising. 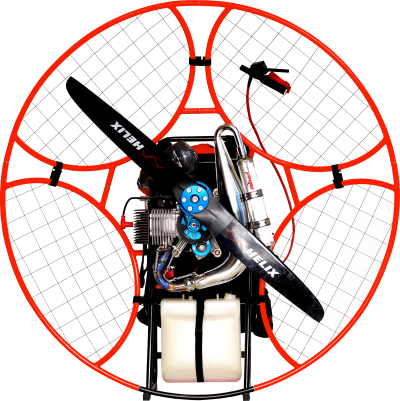 Wrap this engine up to full power and experience one of the most powerful paramotor motors avilable today! From 23kg, it has an excellent power to weight ratio. The 180cc Minari Engine boasts a very impressive 75+kg of static thrust, which is enough to get anybody off the ground with little effort. For even more power, we offer the 200cc Minari F1-M9 CL engine version. Minari Paramotors has designed a four-part aluminum cage that helps to ensure the highest possible safety. Its construction provides shock dissipation so that the impact energy is spread throughout the frame which improves security and protects the engine against damage. The Cage sections are easily disassembled and organized for transport. The new Minari Paramotor Frame and Cage are made of Aluminum and powder-coated with a shiny finish. The Cage sections are available in six stunning colors: Yellow, Orange, Red, Green Blue and Black. The Frame is a gorgeous glossy black, and the resulting Frame/Cage combination has a remarkable weight of less than 11 lbs. 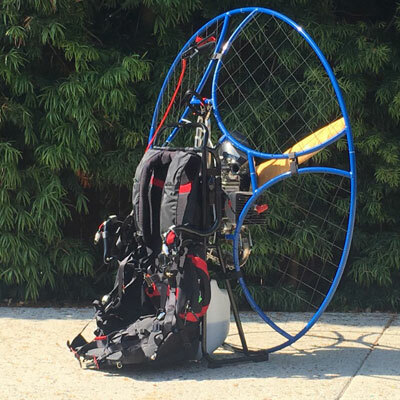 The Cage sections disattach easily to make this paramotor ready to transport. When assembled, the rigid Cage and Frame are light, yet strong - perfect for use with a trike as well! The Minari Harness is comfortable and roomy, good for the heavier pilots that will be using this powerful motor. This harness features a Mid-Hangpoint J-Bar system that is well balanced and responsive, yet remarkably stable and comfortable seating system. We have also added and tested the ABM Low-Hangpoint Arms from Miniplane on this frame with various harnesses, and the result is incredible! The ABM Arms handle the torque beautifully with their offset bends, while the harnesses we tested keep the motor remarkably snug against the back of the pilot, keeping the torque effects very managable. There are zippered pockets on the sides to hold your Fuel Check Mirror, tools, and cell phone as well as any other items you want to bring along. There is also a zippered pouch under the seat to bring along your Stuff Sack in case of an unexpected "out landing". Minari Paramotor - Complete Unit, ready to fly! 12 Liter Fuel Tank for endless fun! See more pictures of the Minari Paramotor HERE! Minari makes some of the most reliable and powerful Paramotor engines available today. 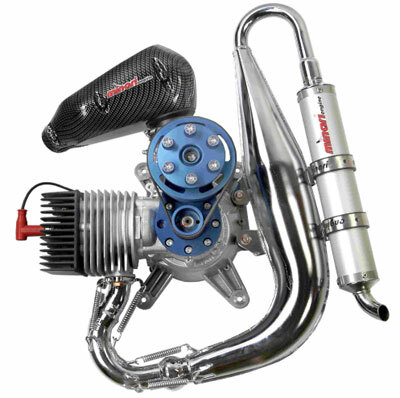 Minari Paramotor engines are 2 stroke and 180cc, made to exacting standards and manufactured on CNC machines using modern technology and finished with special treatment. The cylinders are aluminium alloy Galsi 9 hardened, with the inside having a Nichel-Silicon plating and completely honed with diamond tools and plateau finishing. The pistons have diamond profiles and are completed with 2 rings chromed. The crankshafts are made of forged steel, completely finished. The exhaust system is well sectioned and supported. The power of the new Minari engine on this frame is remarkable. The unit's dry weight is 52.5 lbs and it has a 12 liter tank for plenty of range. Now, pilots over 210 lbs, pilots at high altitudes or Tandem Instructors have a great Paramotor that will suit their needs! This motor starts easily, and idles nicely right away, ready to give it's power! The Minari will require about 10 hours of "break-in" at 2.5% oil mix, when it will run a bit rich and blubber a bit. After 10 hours, the mixture is leaned out to 2% (50:1 synthetic 2-stroke oil) and the motor smooths out. It is important to understand this and break this engine inproperly. This way, the motor has the best chances of giving a long life of service. During the break-in, vary the throttle and do not use full power for more than a few seconds.